We are tired of doing the regular mundane monkey projects. A web application with features for add, modify, delete, view and some database at backend. Very bored of doing this. Only the UI, sometimes the framework changes from project to project and all else remains the same. Sometimes we feel “Wow thats a cool project!” Immaterial of its size, real time implementation or $ involved. Recently I came across a nice cool project on Unmanned Aerial Vehicles (UAV) and wanted to share it with you. jarontec (Chris Anderson) is the man behind this project. He is doing this to gain an understanding on UAVs. 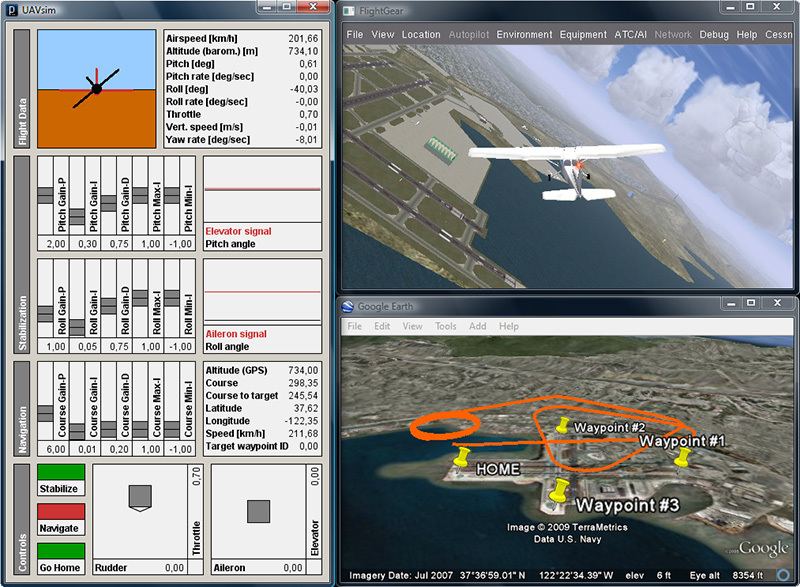 Java is the main programming language and has used FlightGear and Google Earth. He shares the project in GNU Lesser GPL and welcomes to use it in projects. Drop him a note, if you do so. If you are looking for ideas for your college academic project. This is a right candidate and you can take inspirations from this project and extend it. Comments on "Unmanned Aerial Vehicles – uavplayground"
In real sense its cool.. Thanks for adding information regarding ‘uavplayground’. This article is just an introduction to a nice java project. Please don’t get disappointed. We have wide variety of readers here at JavaPapers and some may like this. I have always wanted to do something like this, but never got time or say don’t have that much skill to go for it. If the skill is not there we can learn it and it is not a problem. It is all about priority and finding that time to do such things. Try it man and I bet you can do it. Thanks Joe for sharing this info . do post link for development, source code, tutorials for the amazing stuff. Akki, the link is there in the article. Comments are closed for "Unmanned Aerial Vehicles – uavplayground".